When Marcella, Winnie, Francien and myself left the newly built airport in Mandalay we did not know what to expect from this country which has been isolated for 50 years and just reopened to foreign tourists. The streets and houses looked clean with hardly any rubbish littered around, tarred roads needed repairs, very few trucks on the roads and no industry to be seen. The highway between the airport and the city was still marked with ‘milestones’ divided up in furlongs (old English measure). I saw no uniformed police, no beggars, no western food chains or other western commercial outlets. Women and to a lesser extend men applied tanaka to their faces, a yellowish-white cosmetic paste. 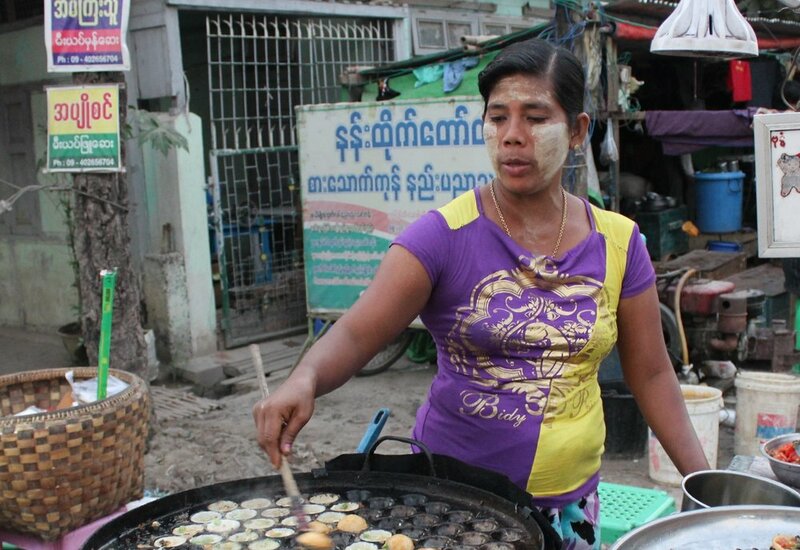 In the cities of Mandalay and Bagan we visited Buddhist temples and monasteries. Less crowded than the temples we have seen in Thailand, Cambodia and Malaysia (there were hawkers outside the main temples, but hardly any tourists), these are more authentic, more spiritual. 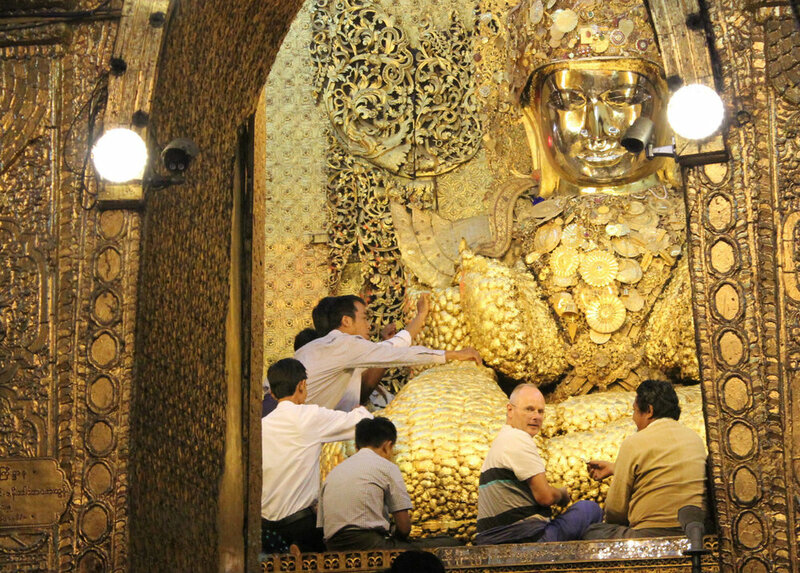 In the Mahamuni temple in Mandalay I stuck gold-leaves to a sitting Buddha (sorry, only men allowed to do that! ), which granted me a wish! The locals were friendly and seeked contact. When strolling with Marcella in the early evening through Mandalay, a middle aged man with a dark complexion and red stained teeth due to years of chewing betel quids approached us and tried to explain (he didn’t speak English) when the next firework display would be on the moat of the 19th century fort; When we waited for a doctor in the local clinic (one of us had a stomach upset), the nurse offered us some milky and sweet coffee; When Marcella wanted to take a picture of a rick-tic fancy fair wheel, she was immediately surrounded by laughing children posing for a picture, parents watching smiling from a distance. Everywhere we sat in a restaurant or checked into a hotel, staff made every effort to make us feel at home. In the rural area between Mandalay and Bagan people lived in huts with corrugated roofs, bullock carts the main means of transportation. The farmers toiled the land with bullock-drawn ploughs (hardly any mechanical machines). Women hauling construction rubble in rattan baskets on their heads and painting the white lines on the roads by hand! Francien and I always wanted to do a hot air balloon ride and what better place is there to do that than above the ancient temple city of Bagan. 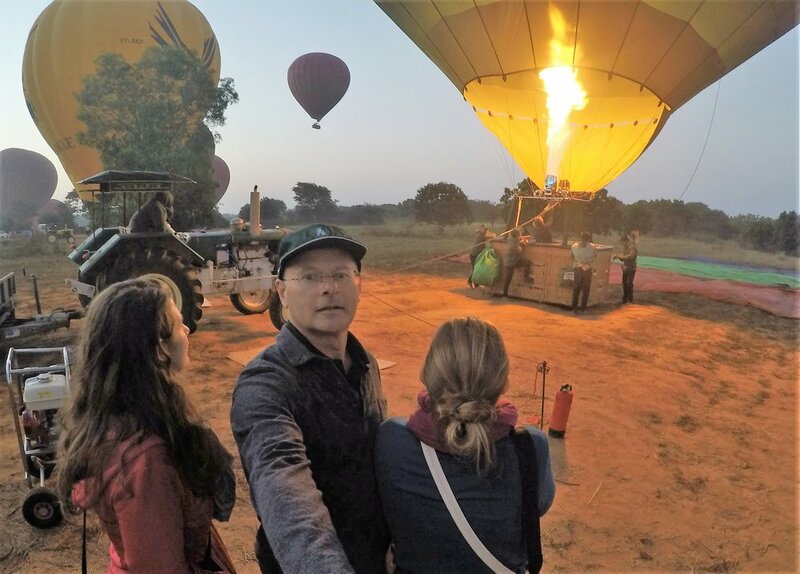 After a pre-dawn breakfast at the balloon launching site we climbed the basket. The air felt crispy, cool with morning dew. The hiss and roar of the burner when we took to the sky made me pause and stare in wonder. As dawn broke and mist lifted, the landscape revealed itself. A bright red sun rose above the crest of the mountains. 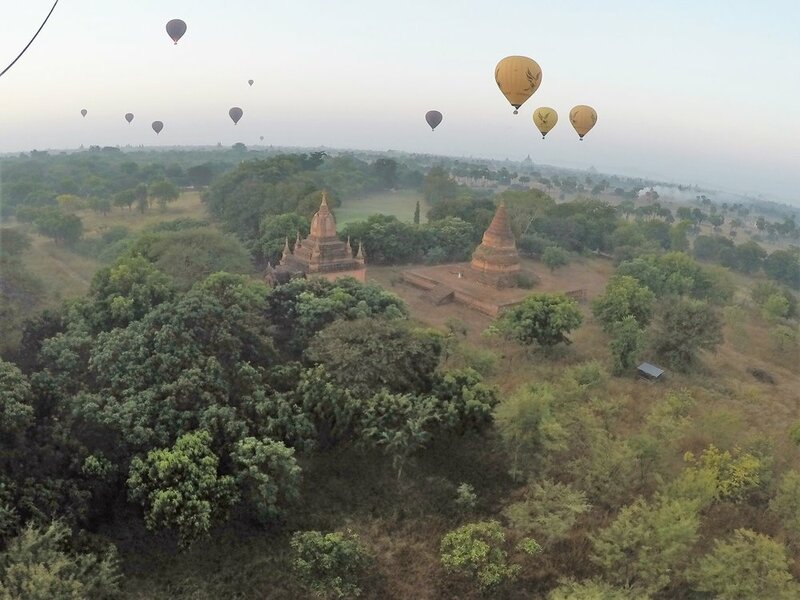 We floated 100 meters above Bagan’s temples watching the sunrise and the world on the ground waking up. We were part of the wind, I felt no movement, surrounded by total silence occasionally disturbed by the sound of the burners of one of the other balloons. The landscape was dotted with thousands of reddish coloured temples, stupas and monastic structures. I watched the gold domed Amanda temple towering high above the other pagoda’s which we visited the day before. Winnie, Marcella and myself got a glimpse of the whole Bagan, its temples, the surrounding villages and farms, the Irrawaddy River running low with big sandbanks sticking out and distant hills. Silently Richard, our English pilot, manoeuvred the balloon only a few meters above a village waking up to a new day, scaring the bullocks in the corrals and hearing the monks chanting morning prayers. Well let me tell you, if there ever was a mystical and peaceful experience, this was it! After a smooth touch down Richard handed us our certificate. ‘You are now officially balloonatics’ he toasted with a refreshing glass of champagne. Not a bad accomplishment! I felt like the countryside in this part of Myanmar was similar to the ‘High-Veld’ in South Africa; the arid sand fields with a few lush bushes, the arcadia trees, rolling hills, dry riverbeds, the occasional cactus, people walking in the fields hauling products on their heads, the wide blue sky. Back in Mandalay I jogged the 4x2 Km around the old fort, watching the saffron coloured robed monks carrying containers in which they collected their alms, listening to the army band play what I thought was the national anthem inside the fort, saw people jog in their everyday clothing. The men wore the humble longyi wrapped around their waist. I tried to imagine the lives of these people I did not know. Although this country is the poorest country in South East Asia, people seemed to live a happy live. They lived in primitive but decent housing, living of the fertile land and indeed always smiled!